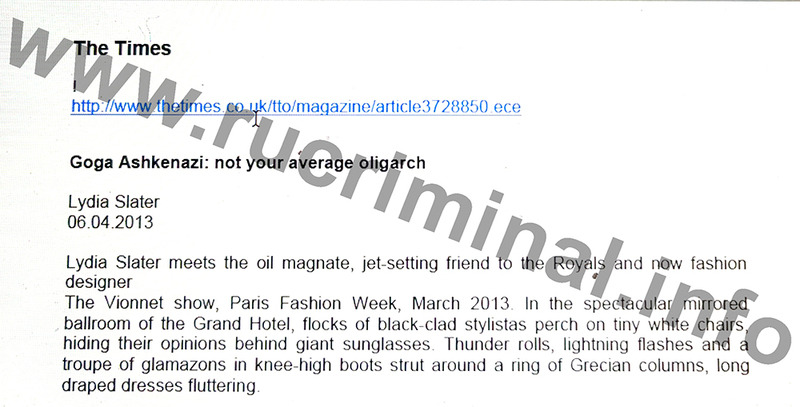 rucriminal.info he continues to talk about the unprecedented PR activity of Kenes Rakishev in Kazakhstan, Ukraine, Russia and Europe. He pays for dozens of positive materials, both about himself, about the companies where he is the owner, and about his friend and senior business partner, the son-in-law of the President of Kazakhstan Timur Kulibayev. In particular, through the Weste media Kulibayev is "excused" from relations with Goga Ashkenazi. At the same time Rakishev and Kulibayev "wet" through the media opposition, and sometimes the daughter of Nursultan Nazarbayev Dariga. Kenes and Timur believe that it sometimes harms their common interests. In the last article, we reported on how Rakishev praises his person in the media. And now let's move on to his other PR-shares. 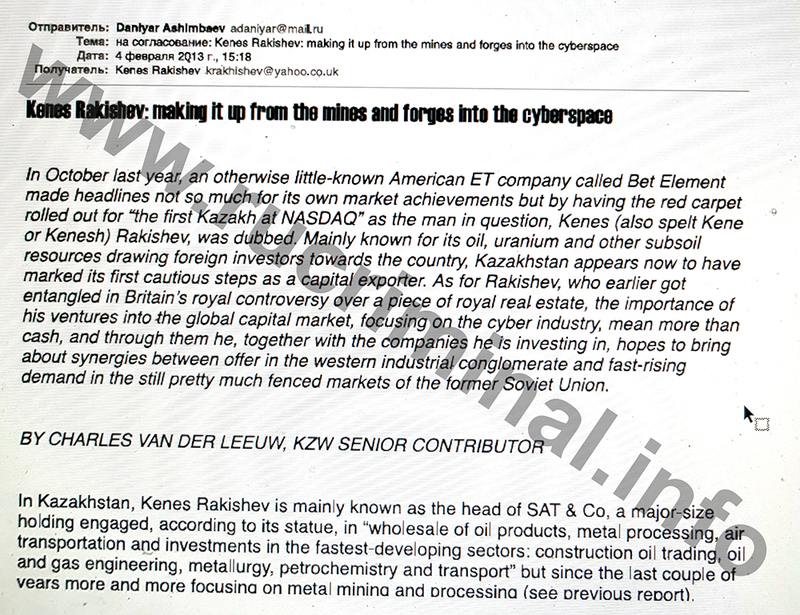 Recall that all instructions on what and where to go Rakishev gives Daniyar Ashimbaev (full-time PR Manager "verhushki" Kazakhstan), whose correspondence calls "brother". So, giving regular instructions and allocating unaccounted cash to the accomplices, says Rakishev Ashimbaeva, obviously, with a smile, "Papini Dariusu". (We are talking about Dariga Nazarbayeva). The speaker takes "under the hood" and is associated with an assigned clerk Kosenko. Kosenko writes materials on many custom themes, both negatively critical and positively image. 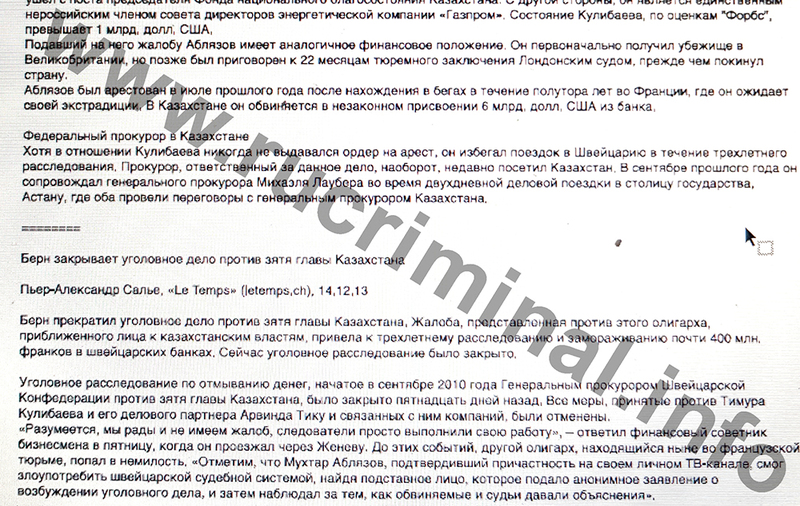 So, according to the materials at the disposal of Rucriminal.info, December 23, 2013 Ashimbayev instructed Kosenko to write: "1. Review of recent events with Rakhat (fallen into disgrace Rakhat Aliyev-Ed) – remember the case of Sarsenbayev, Dariga's open letter (a couple of kicks would not hurt her), how "the Republic" relished the details, etc. ", and "NCE-the results of the year". Ashimbayev, by order of Rakishev, takes an active part in the formation of a positive image of Kulibayev and people around him. 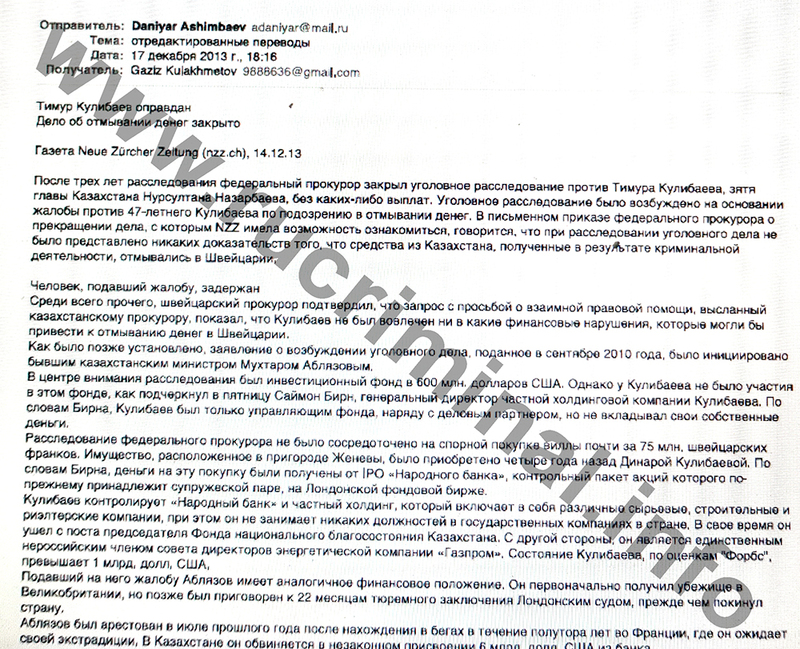 So, on December 6, 2013 he sent for approval Dzhambulat Sarsenov (then a member of the Board National chamber of entrepreneurs of Kazakhstan, Deputy Chairman of the Association "Kazenergy", member of the Executive Committee of the Kazakhstan Boxing Federation) letter, which contained an extensive biographical material about Kulibayev for posting on Wikipedia. On the same day, Sarsenov said to him: "About leaving the UK need to reformulate and remove the F Ozen." At the same time, Ashimbayev also orders, and then publishes materials of a negative nature and about the personal opponents of Kulibayev and Rakishev from among the representatives of the Kazakh ruling elite. 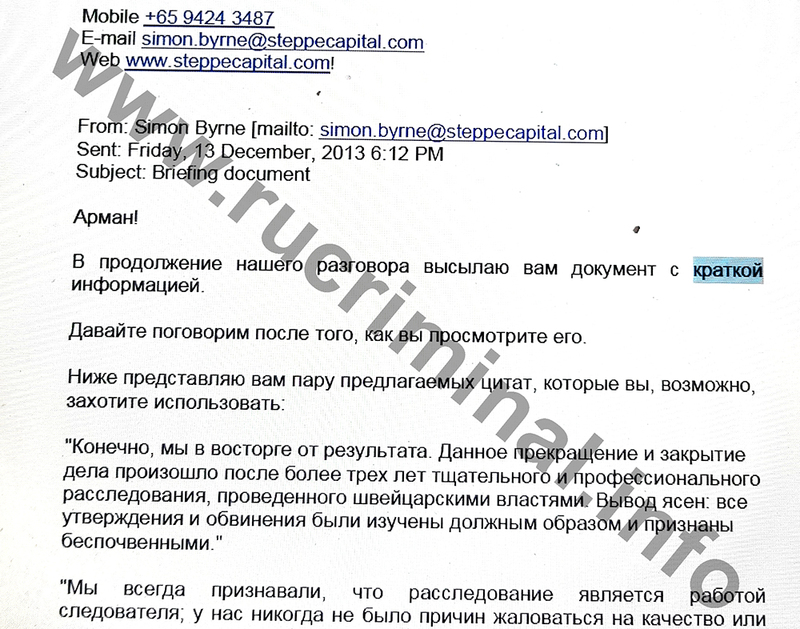 For example, on July 25, 2012 Ashimbayev sent for approval the material "Black holes" Samruk-Kazyna", which negatively characterized the activities of Umirzak Shukeyev, who replaced Timur Kulibayev as Chairman of the state welfare Fund "Samruk-Kazyna". The materials were in the original language and translated.